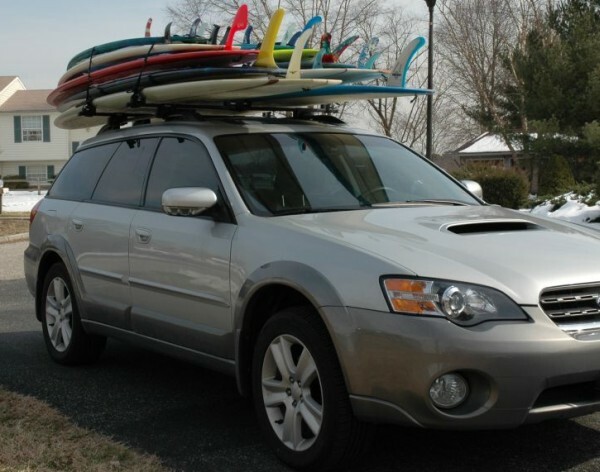 Surfboard Racks for Your Car! By now you have heard from enough people to realize that Thule or Yakima are the best "fixed, hard rack" options for carrying your boards. If for some reason hard racks are not an option, Fin Control Systems (FCS) makes a great soft rack if a fixed, hard rack is not an option for you. This may be hard for some to believe, but I own and use all three of these rack systems  ;) ! I find the Thule with the board mounts to be the most secure, but a bit of a hassle if you carry many different boards, as I do, you have to move the board mounts for each separate board. While it only takes a few minutes that is extra time you have to take packing instead of riding. 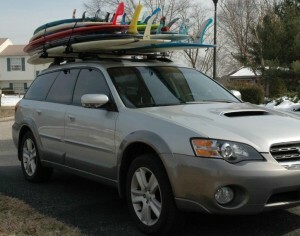 It was mentioned that the Thule board mounts allow only 2 boards to be carried. It is certainly true that the Thule straps will only mount 2 boards per set of board mounts, but if you add a separate strap you can haul more. 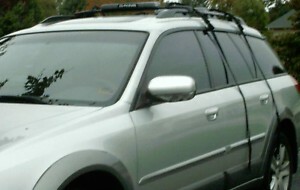 Also it was noted that a friend's rack/strap combo hauled more than the Thule board mount. If you check the manufacturers advice you will find 3 short boards or 2 longboards listed for both of them. The set my buddy uses is very convenient, but I find it does not hold my boards securely enough so I combine it with a separate back up strap. Additionally, I prefer a pad with a separate strap to the combination units. 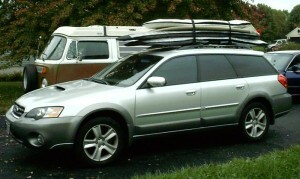 By the way, I recently took 7 boards on my Thule rack to the Cape Hatteras' Outer Banks -- it has 2 sets of board mounts. If you choose a hard rack and do not use the attachment designed by the manufacturer, I recommend the silver Dakine rack pad and deluxe Dakine strap. The rack pad comes in a round or flat configuration, does not get as hot (because it is reflective) and has held up much better that the shop advertising brands. Locally, the Malibu Surf Shop carries these pads and will frequently give Annapolis Surf Club members a discount. I prefer the Dakine deluxe strap for the same reason as the K-Coast strap mentioned in a separate post, the loop - which makes attaching it to the rack very easy and secure. But the Dakine strap also has a bungee built into it which makes securing the boards very easy and keeps the strap tight even when wet (the nylon strap stretches when wet). I have carried 5 boards stacked on top of each other with this strap. The only problem I have with the strap is that it is hard to find (I bought my first pair in Hawaii) -- I now purchase them from Wetsand as I have not been successful in getting a local shop to even special order them. The last bit of advice I can give is to make sure whatever rack you use is installed properly. Obtain expert advice from the shop personnel when you purchase the racks. However, as it has been pointed out, you can save quite a bit of money by purchasing Yakima or Thule racks over the Internet (which means they will be little help with the installation). Even if purchased from a shop you may not get the best advice because the staff is not always very experienced. A quick check of the rack after installing it is to grab each end of the bar and shake it up/down and side-to-side, if it moves, it is not installed properly. Note: Thule or Yakima have "configurators" on their websites that itemize the specific components/configurations needed for your vehicle. - By Chris "7-Eleven" Smith et al.